Anyone who has kids or pets know that having a screen door is a disaster. Either the kids or dogs are constantly running into it because they don’t see it. All they see is the beautiful outdoors calling them. So they take off at a full gallop and charge towards the screen door. One of two things happens. The child/animal either hits the screen door and bounces back injuring themselves. Or (and this is more often than not what happens in my house) they burst through that screen, taking it with them, as they gallop into the wild blue yonder. Screen doors are not cheap. And have you ever tried to re-screen a door? It’s a total pain. Well it looks like someone has finally come up with a solution for our problem! There is now the MEGA Mesh Screen Door. In place of screen door or sliding screen door you would install the Mega Mesh Screen Door. Basically this is a screen that over laps creating a seal to keep bugs out but allows in the fresh air. Then when the children or animals charge the door they end up running through the mesh. And because it’s two separate pieces that overlap they just separate and the running person or animal just passes right through. No one gets hurt. And no screen doors fall victim to running objects. This is a great solution for those who want to have a screen door to let in fresh air and keep bugs out. But have pets or kids that have ruined screen doors. Now you can have the best of both worlds. The kids and pets get to run in and out of the house without slowing down and you get the fresh air! Click here if you would like to order your own MEGA Mesh Screen Door today! 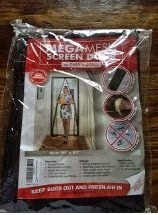 I received MEGA Mesh Screen Door for free for evaluation purposes. Regardless, all opinions expressed are still 100% my own. I am disclosing this in accordance with Federal Trade Commission 16 CFR, Part 255 Guides Concerning the Use of Endorsement and Testimonials in Advertising.